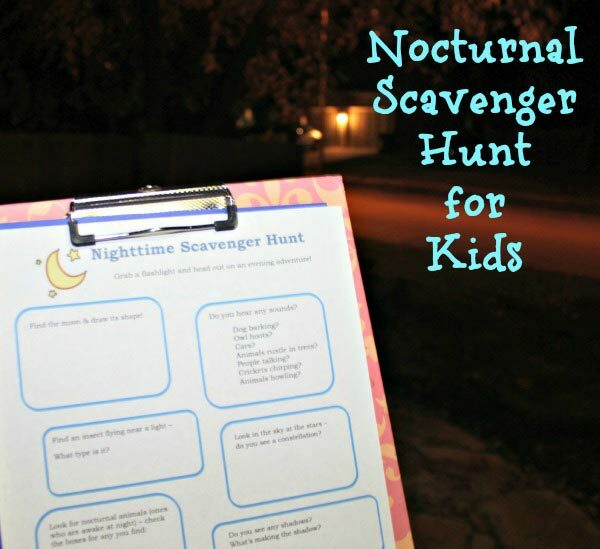 Grab this FREE printable Nighttime Scavenger Hunt list and go explore the outdoors one evening! and the Zoo Scavenger Hunt is perfect for your next visit to see the animals. Scavenger hunts are a great learning tool -- they help kids to hone their observation skills, practice reading and get out to explore the world. Most scavenger hunts are done during the day but for our *newest* scavenger hunt, I was looking for something different. I wanted one that was more of a challenge for kids and included some cool science concepts. Nighttime is both an intriguing and unexplored time of the day for most children. It's a time when another part of the world wakes up -- and so many new things can be learned, heard and discovered during a walk in the dark. 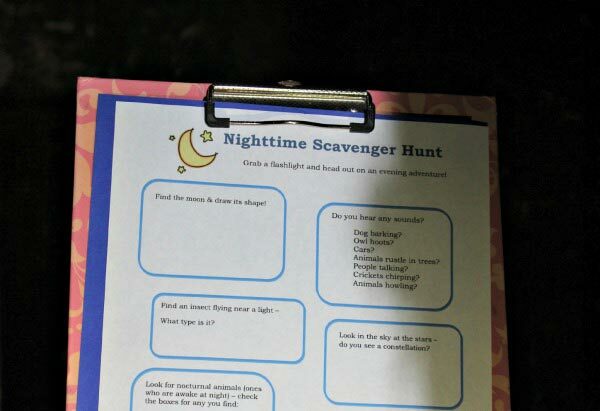 This nighttime scavenger hunt list introduces kids to nocturnal activities -- things that take place after the sun sets. We're including a FREE printable list of items to find along with affiliate links for books and things we've found useful on our scavenger hunts! a person's senses are tested -- kids are more likely to use their sense of hearing when they explore at night since their sense of sight will be limited. You'll probably need a flashlight for your search (and a jacket too if you're heading out in the Spring or Fall)! Or take along some glowsticks for added fun. If you have a set of binoculars with night vision (these are seriously cool!) or even a pair of kids' spy gear night glasses -- both will help to enhance your vision after dark! Your kids will really enjoy exploring their neighborhood or a local park -- animals, stars, odd sounds and weird shadows. 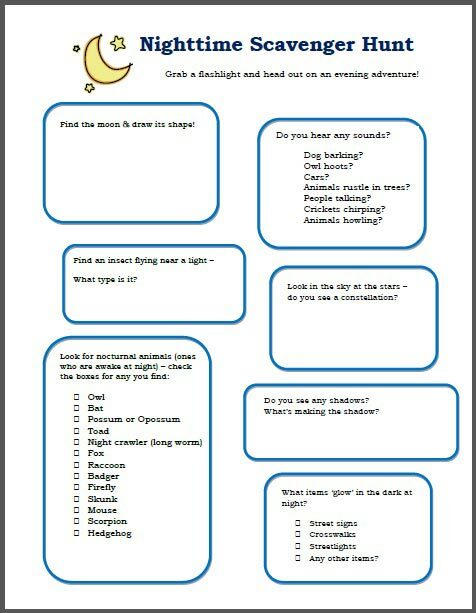 This is also a really great activity if you have kids who might be scared of the dark -- it shows them that the world at night is more interesting than it is scary. Where Are the Night Animals? The perfect science book for any nocturnal adventure -- this nonfiction story is a cool peek into what animals do while we humans are asleep! Little Owl's Night -- Little Owl wakes up to the sights and sounds of his world but as he looks around at all his friends, he can't help but wonder what it might be like during the day. Will he be able to stay awake to see? Younger kids will enjoy this flipped bedtime tale! Owl Moon -- A favorite read for winter nights, Owl Moon is the tale of a father/daughter nighttime walk as they head out to see an owl together. The book is beautifully descriptive of all that you might experience on a cold winter evening. Out of Sight Till Tonight! : All About Nocturnal Animals -- Our favorite Cat is back and out to explore the night with his friends! This is one of the newer books in the Cat in the Hat's Learning Library and introduces nocturnal animals from across the globe along with some of their nighttime behaviors. Moonlight Animals is another peek into wildlife at night! Kids will enjoy how the special flashlight included in the book illuminates parts of the pages. There's also a great "Did you know?!" 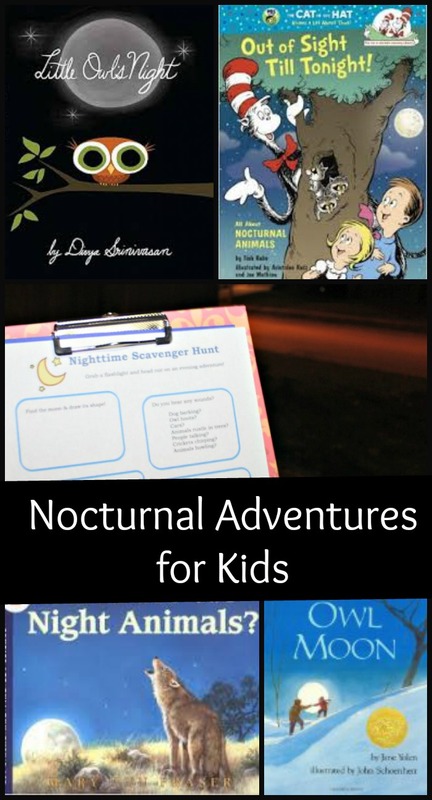 section with fun facts about nocturnal life & animals. noticing things like constellations, what happens when the sun sets, etc. Plus, if you're doing the hunt during the summer months, it's SO much cooler at night that you'll enjoy some outdoor time without the heat! Use the form below to get your copy of the Nighttime Scavenger Hunt and see what's going on in your neighborhood this week! If your kids enjoy the stars and night sky, they'll also LOVE these activities: Astronomy for Kids: Great Books & Marshmallow Constellations! Scavenger hunts are the bomb!